Shimadzu RADspeed. 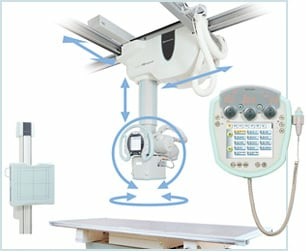 The RADspeed is a high-performance general radiographic system. It is designed for optimal daily workflow, as a general X-ray system, wireless, tethered and fixed flat panels can be selected to best match your workflow. When the APR is selected for the region being imaged, the collimator filter also switches. 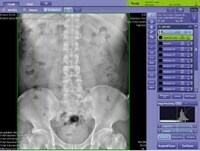 Using the filter preset for each APR, such as the extremities or abdomen, minimizes unnecessary exposure to obtain high-quality radiographic images at the optimal X-ray dose. Built-in Area Dosimeter or Calculated Dosimeter* is available (option). X-ray tube support vertical range of 1,600 mm ensures sufficient SID when examining supine patients and low focal point radiography of standing patients. This support also rotates on the vertical and horizontal axis in addition to fixed positioning at any desired angle, enabling fast positioning at complex angles for orthopedic applications. 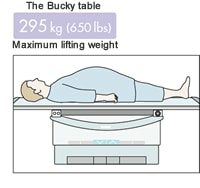 The Bucky table can support 295 kg (650 lbs). 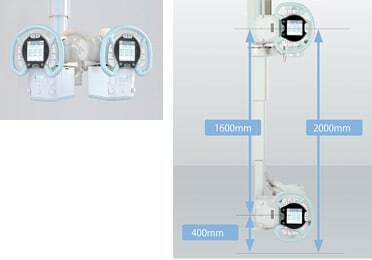 The ceiling-traversing overhead X-ray tube crane coupled with the Bucky device ensures easy operation and features a highly rigid construction and a durable shock-absorption mechanism. Up to 800 Anatomical Programs can be registered on the system. Registering the conditions as programs associated with examination area and technique allows conditions to be set up smoothly. 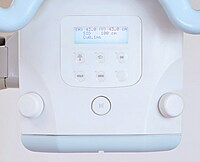 The LCD screen and illumination color can change according to the Bucky table or X-ray tube settings selected. Different alarm sounds can also be specified for various events, such as when preparation for exposure is complete. Using a DR system saves more than 60% of your time because registering the patient and cassette handling are no longer a part of the workflow. You can perform your examination and read the image in a few moments wherever you are. 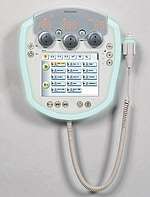 Also Auto field size selection of collimator and Auto Stitching-Speed Stitch is available with DR system. 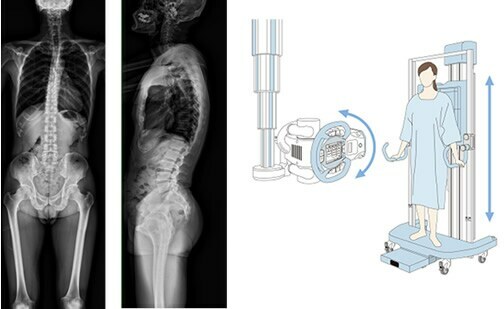 Images are taken while swinging the X-ray tube and moving the FPD.These images are automatically stitched together to obtain wide-range images along the body axis instantly.